Product prices and availability are accurate as of 2019-04-11 18:29:26 EDT and are subject to change. Any price and availability information displayed on http://www.amazon.com/ at the time of purchase will apply to the purchase of this product. 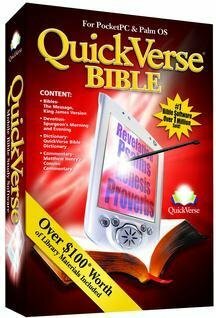 This mobile Bible study software contains two Bibles (The Message, King James Version) and four references (Matthew Henry's Concise Commentary, QuickVerse Bible Dictionary, Spurgeon's Morning and Evening, and Ten Daily Reading Plans)--formatted for your PocketPC or Palm device. Readers can set bookmarks, create reading plans, highlight scripture, and find scripture quickly with search engines. System Requirements: Installation CD-ROM: Pentium Processor or better. Windows 98, ME, 2000, or XP Operating system: PocketPC 2002 or greater, Palm OS 3.1 or greater Hardware: PocketPC, Palm, Handspring, or Sony Clie with 8 MB of RAM or greater.